Whether you’re replacing the siding on your home, or you’re finishing up your home build with its final touches (which means new siding), then you have an opportunity to get creative. While there are endless siding colors out there, and numerous siding materials, we’re going to focus on an aspect of siding that often goes overlooked up until the final decision — siding patterns. There are a vast variety of siding patterns that are available for homeowners, making their homes a veritable canvas for siding orientations. While most homes have traditional horizontal siding and a bit of trim to provide accents to the home, there are certainly more options out there. Here are a few patterns that you can mix and match to make the most of your home’s facade. Horizontal siding patterns are the most common, and they’ve proven themselves thanks to their incredibly effective protection against precipitation. This traditional siding method still has a variety of patterns available, including traditional lap siding, dutch lap siding, and beaded siding. Lap siding is the most common pattern. It’s simple, effective, and easy to install. Lap siding features siding boards that are partially layered on on top of the other. This creates an effective water barrier, where precipitation rolls over the surface of one piece of siding and down the surface of lower sections of siding. Lap siding is often the least expensive option, and it’s aesthetic is widely accepted as a normal, traditional siding pattern. Dutch lap siding is similar to traditional lap siding, although Dutch siding features a groove cut out of the top of each horizontal board. Dutch lap is just as effective as traditional lap siding, and its groove provides a bit more textural contrast across the surface of a facade, since each panel will cast more of a shadow on the grooved panel beneath it. Consider Dutch lap siding for a traditional look with just a bit more character than normal lap siding. Beaded siding is a common vinyl siding design that updates the concept of lap siding with a bit of extra texture. Beaded siding features a “bead” at the bottom of each horizontal board which provides a more textured surface than traditional lap siding. Consider beaded siding to break up the composition of your home. Alongside horizontal siding patterns, you’ll find homes with vertical patterns. While vertical patterns are less common, they may prove ideal for certain home styles, and their often used to accent eaves across the facade of a home. Vertical panel siding is just as simple as traditional lap siding, but it is vertically oriented. The siding will look relatively flat, and panels are placed one on top of the other, with their surfaces flush. Board and batten siding is a traditional vertical siding which got its start in wood siding. In this pattern, vertical boards are placed with battons covering their cracks, creating a waterproof surface that is fairly successful at shedding water. The raised batten casts a shadow on the boards of the siding, creating an attractive texture across the surface. Nowadays, board and batten designs can be found in vinyl and fiber cement siding, giving homeowners the same traditional aesthetic of wood board and battens, while being more affordable and durable. On top of horizontal and vertical siding patterns, you can find a variety of shake patterns that can be used as accents across the surface of a home. Shake siding began as wood shakes used to be used to cover the surface of homes. Since then, other siding materials have been used to mimic that wood look. Square shakes are just that: small shakes that are cut into squares and layered row upon row. Square shakes look quite traditional, yet they add a bit of quiet character to a home when used alone or paired with vertical or horizontal siding patterns. Rounded shakes feature a lower edge that is cut in a semicircle. These shakes give a home a quaint, cozy look, and their often seen beneath the eaves of a home. Oftentimes, you’ll see shake patterns that feature shakes that are staggered from shake to shake, creating an interesting texture. This technique breaks up rows even further, providing a more interesting composition on a home. Mitered corner shakes are essentially square shakes with their corners mitered off. This technique creates even more of a textured surface, which may be desirable for accents around your home’s facade. If you’d like a more decorative look for your abode, then you may consider mitered corner shake siding. Octagonal and hexagonal shakes have bottoms whose edges are cut two or three times, creating half of an octagonal or hexagonal shape at the lower edge of the shake. These shakes are very similar to the mitered corner design, and their geometric edges prove visually pleasing. Fish scale shakes are designed to look like the scales of a fish, thanks to their rounded lower edge. Fish scale shakes are a creative way to add a bit of an organic look and more texture to the facade of your home. Some homes have individually painted shakes to provide even more excitement and character. Half cove shakes have quarter circles cut into their bottom two edges to provide a unique, “toothy” look to a facade. This texture is highly appealing, and when rows of half cove are staggered one atop the other, the finished product proves intriguing. Here at Airtight Exteriors, we know our way around siding, and we’ve worked with all sorts of patterns over the years. If you’re updating your home or finishing your home with new siding, we’d be ecstatic to help you find the ideal option to fit your home and your vision. We work with a variety of siding providers, and we’d be happy to walk through their catalogs to discover siding patterns that look best on your home. If you’re ready to get started or curious about the siding options we have available, simply give us a call! 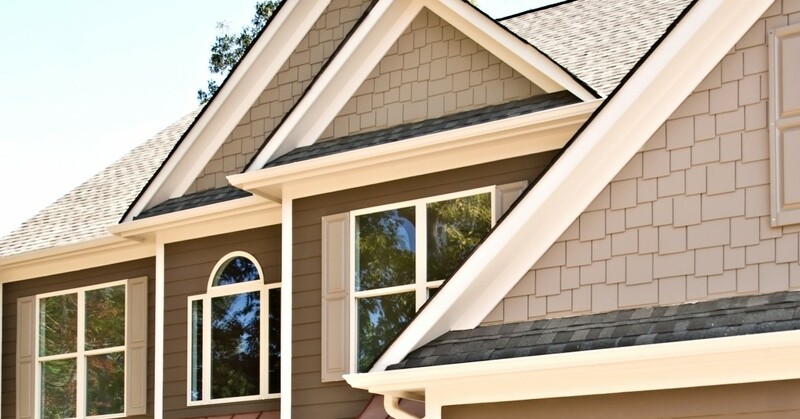 We provide siding installations throughout Lakewood and the surrounding area.